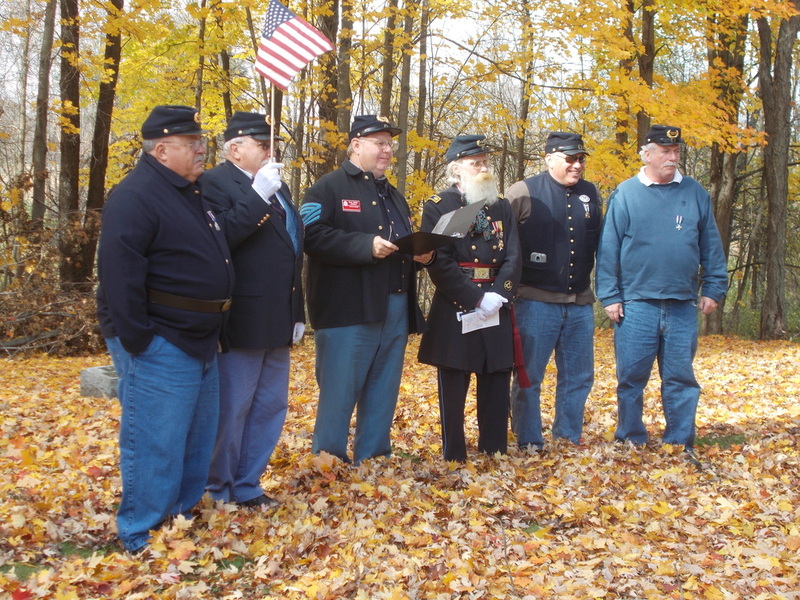 On Sunday, October 19 at 2 p.m. the Sunfield Historical Society and the Lansing/Sunfield Curtenius Guard Camp #17, Sons of Union Veterans of the Civil War gave a walking tour of the Welch Cemetery and the Freemire Cemetery in honor of our Civil War Veterans. 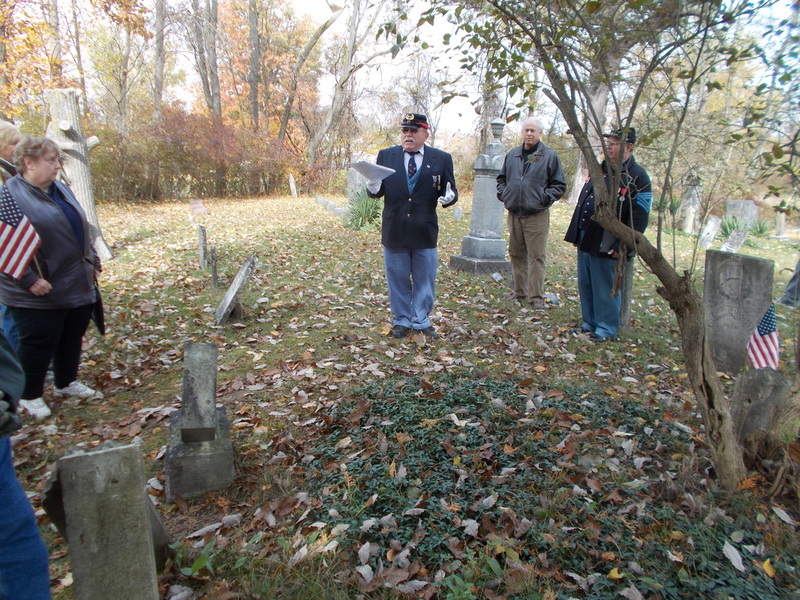 We met at the Welch Cemetery at 2 pm located on west side of Shaytown Road, south of M-43 where we honored Samuel W. Grinnell, John B. Freeman, Dwight Barnum and Henry B. Dow. We then traveled to Freemire Cemetery located on the west side of Brown Road, between Bismark Road on the North and Kelly Road on the South, to continue our tour. There we honored Thomas Walsh, Wallace Evans, Milo Deuel, Dewitt J. Loomis and Warren A. Gorham. It was a beautiful fall day and the walk was enjoyed by all. Nor our voices keep silent in accents of praise. They fought, bled, and died, neath our flag that still waves. To strew o’er their graves the flowers of the Spring. In these graves they are taking the final repose. In these dark lonely cells ‘neath these grass covered mounds. For those heroes who died with their face to the foe. Found death by starvation, their only relief. For those heroes who die with their face to the foe. It’s the lives of our heroes in the graves we stand round. Where no one can tell the Blue from the Gray. The once mighty army’s great chieftains; departed! The absent they speak to us now from the grave. True patriots, staunch heroes, and bravest of men. Where suffering and trials, have all passed away. Samuel W. Grinnell - Born February 23, 1823 at Hillsdale, Columbia County, New York the son of Daniel and Lydia Grinnell. He was a veteran of the Mexican-American War (1846-1848). He enlisted in the army for one year at the beginning of the Mexican War and after returning to New York upon the expiration of his duty, he discovered that his mother had died. He then reenlisted on August 25, 1847 at the age of 24, for the duration of that war. Samuel W. Grinnell enlisted as Sergeant in Co. G, 12th Michigan Volunteer Infantry at Sunfield for 3 years age 39, on December 9, 1861. He was mustered in on January 8, 1862. He was captured by the enemy at the Battle of Shiloh, Tennessee April 6, 1862 and was held prisoner by the Confederates for two months at Montgomery, Alabama and four months at Macon, Georgia. He was paroled back to the Union Forces in October 1862 with his health badly impaired due to inhumane prison treatment. He walked to Washington, D.C., arriving there nearly starved and frozen. He recovered enough health to finish out his enlistment and returned to the regiment at Middleburg, Tennessee on March 14, 1863. Private John B. Freeman - Born January 3, 1842 in Allen, Hancock County, Ohio, the son of Job Tarlton and Eveline (Barnes) Freeman. The Freeman family lived in Allen, Hancock County, Ohio during the 1850 census and relocated in Roxand Township according to the 1860 census. Private John B. Freeman didn’t have the opportunity to join the G.A.R. because he died August 28, 1868 of consumption in Roxand Township, Eaton County, Michigan. He enlisted from Eaton County at the age of 20 as a private in Company H, Michigan 13th Infantry Regiment on 11 June 1861. He mustered in on 17 Jan. 1862. He was mustered out on 30 May 1865 at Detroit. Dwight Barnum - Born Feb 6, 1844 in Michigan the son of Willis and Rachel (Van Houten) Barnum. At the age of 19, he enlisted on September 9, 1861, in Co. B. 2nd Michigan Cavalry. He died on April 15, 1862, at New Madrid, Mis-souri. Dwight was the brother of Watson Barnum who also enlisted at the age of 18 as a Private on March 18, 1864 at Sunfield, Michigan in Company B, 27th Infantry Regiment Michigan. Dwight mustered out on July 26, 1865 at Delaney House, Washington, DC. Watson died December 25, 1871. ﻿Corporal Henry B. ‘Hank’ Dow﻿ - Born July 30, 1834 at Seneca County, New York He was the son of John VanNess Dow, grandson of John D. Dow, and great-grandson of Richard Dow. He married Ellen Amelia Green on May 14, 1857 in Eaton County. She was born July 30, 1837 in New York, the daughter of Eri A. Green (1803-1880) and Joanna K. (Kelly) Green (1806-1857). Henry B. and Ellen Dow were the parents of one child, Rachel Joania ‘Joie’ Dow born June 5, 1858 at Roxand Township, Eaton County, Michigan. Ellen A. (Green) Dow died October 1, 1859, age 22 years. Henry B. Dow enlisted from Eaton County as a corporal on August 6, 1861 at Charlotte for 3 years, age 24, and mustered in Company H, 6th Michigan Infantry, August 20, 1861. He died at home in Sunfield on January 3 or 30th, 1864, at the age of 27, after a lingering illness/disease resulting from army hardships. Thomas Walsh - Born in Portsworth England December 2, 1832 the son of Joseph and Bridget Walsh. Enlisted in the “Eaton Rifles” at Charlotte, Eaton County, Michigan on August 21, 1861. Thomas was married to his first wife Welthia Kinne, daughter of Japheth Kinne and they moved to Bismark, Sunfield Township in 1858. Thomas Walsh married for the second time to Emeline Stockley on January 17, 1863 at Sunfield Michigan. Thomas Walsh died January 30, 1895 in Sunfield, Eaton County, Michigan. Wallace Evans - Wallace Evans is first located in the 1850 Pittsfield, Lorain County, Ohio census living with the John Scott family. He is only 7 years old at the time and born in Indiana. It isn’t established whether he was their relative, or exactly what the circumstances were at that time. By the 1860 Woodland, Barry County census, he is living with Thadeus and Eva Houghton at age 17. Wallace enlisted from Woodland, Barry County at age 18, as a private on May 8, 1861. He was mustered in August 22, 1861 in Company I, 7th Michigan Infantry and mustered out June 23, 1862. Wallace Evans died April 14, 1863. Milo Deuel - Born September 24, 1835 at New York son of Zina Deuel and Angeline (Shaw) Deuel. Milo married Mary Cazier on June 26, 1856 in Eaton County. Milo Deuel died June 27, 1893. Milo Deuel enlisted at Vermontville for 3 years, age 27, as a private in Company H, Michigan 6th Infantry Regiment on August 13, 1862. Joined regiment at Camp Williams, Louisiana, October 1, 1862. Mustered out on July 24, 1865 at New Orleans, Louisiana. He was one of the 6th Michigan Infantry soldiers to also be designated as serving in the First Michigan Heavy Artillery. Dewitt J. Loomis - Born at Palermo, Oswego County, New York, December 15, 1844 the son of Silas Parks Loomis and Jane Elizabeth Yates. Dewitt died February 12, 1926. On Jan 20, 1875 he married Hulda A. Hall at Sunfield, Eaton County, Michigan and they were the parents of 2 known children, Adella and Josephine Mary Loomis. Enlisted in the 8th Michigan Infantry on April 10, 1865. Warren A. Gorham - Born at Ellridge, Onondaga County, New York November 17, 1824, the son of Shubeal Gorham and Mary Polly (Carpenter) Gorham. Shubeal who was a veteran of the War of 1812, and received a bounty land grant for his service. His Grandfather Ephriam Gorham was a veteran of the Revolutionary War. Warren Gorham married Mary Jane Vandewalker on July 4, 1850 at Auburn, Cayuga County, New York and together they were the parents of 8 children. Warren enlisted in Co. I, 7th Calvary on February 13, 1865 and joined his unit in Virginia on March of 1865. Warren contracted typhoid fever and spent two months in the hospital at Leavenworth Kansas. He received a disability discharge on July 25, 1845 at Fort Leavenworth. He never fully recovered from the effects of the fever. Warren died September 2, 1911 at Sunfield, Eaton County, Michigan. After the war, he purchased 80 acres in section 21, Sunfield Township. He died at his farm in Sunfield, Eaton County on September 2, 1911.